Thirty years ago the biggest killer in the population of most western societies was smoking. Twenty years ago AIDs was predicted to be the biggest killer in these countries. Today, there is no doubt, Obesity is the biggest killer of people in the USA and Great Britain but is increasingly becoming a problem in other western countries. More people in the western world are dying of obesity than smokers are dying from smoking related diseases. The problem seems to be increasing affluence. Strange to say but just about all human attributes, both physical and mental can be measured and graphed. The result is normally a bell shaped curve with most of the population grouped in the middle. You can find your average height and weight, in the charts on height-weight ration. Most people are aware they are carrying extra pounds but how far you are over-weight can be calculated by looking at the chart. Here are some interesting obesity facts:- You can count yourself as obese if you are significantly (more than a few pounds) over weight. You can count yourself as having a vastly increased health risk if overweight by 20% or more. One measure which is still used is Body Mass Index (BMI) which is dividing your weight, expressed in kilograms by your height in meters squared. Internet based calculators are available to those who do not want to do the math. BMI does not work well, as an indicator for people with developed muscles. However, increased attention is now focusing on shape. Basically people who are apple shaped are more likely to develop diseases than people who are pear shaped. So scientists and mathematicians are now trying to develop a waist to hip measurement ratios. When this is available in the public arena we will include it on the age-well.org website. 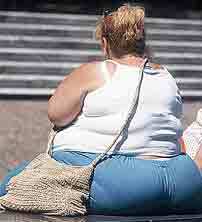 The term morbid obesity means people who are over 50% above their ideal body weight or are over 100 pounds overweight. It can also refer to people who havea a body mass index of above 39. When we are overweight we are basically stressing all our organs and frame (the skeleton) because it was not designed for this extra burden. Imagine filling a bag with heavy rocks or stones, say 28 pounds and then carrying this around with you. You would strain muscles, your breathing would be labored, your heart rate increased and, depending how you carried this bag, you would probably get back ache. People with obesity frequently have increased heart rate, increased breathing rate, and back ache. It follows from this (rather like night follows day) that people with obesity have a tendency to develop indigestion, heart disease, high blood pressure, arthritis, anxiety, depression and stress and have an increased tendency to develop some forms of cancer (breast and prostate). Recent research is also linking Alzheimer’s and other forms of dementia to Type 2 diabetes, so this is an additional motivation to control our weight. People with obesity are more likely to also have a build up of fatty material in the walls of arteries - known as atherosclerosis or arterioslerosis which often leads to stroke and heart attack. Yes but obesity will not kill me? Well obesity will not kill you but it puts you at risk of developing conditions which will make life uncomfortable and could lead to premature death. Consider how many people were going to be killed by AIDs? The number dying in Great Britain, a country of 60 million people, has around 400 people per year die from AIDs. Around 3000 to 4000 people die in road traffic accidents but the number of people dying prematurely from obesity is considered to be more than 30,000 per year. Consider a USA state such as Mississippi, two thirds of the population is regarded as overweight and one third as obese. Now in the USA and the UK obesity is the biggest killer. And the trend is spreading to other countries. Firstly, try not to put on weight. Losing weight in most people is more difficult than putting on weight. The body tends to instinctively store extra food (in most people) and the body finds it difficult to then break down the store when food intake is less. So there is, in most people, a built in mechanism, within the body, to put on weight. Also people with obesity frequently do not perceive internal cues. Most people should have an internal cue which says their stomach is full and it is time to stop eating. Obese people frequently do not have this internal cue. To lose weight an obese person has to rely on external cues. The obese person has to learn to look at a meal and judge a reasonable meal, then eat only that amount. If hunger strikes, he or she should eat fiber such as fresh fruit. This is an obesity fact and one which people who are overweight often are appear to ignore. If you have a moderate weight problem then try dieting and exercise. As a general rule diet improves weight and exercise improves shape but both together helps decrease weight. If you are very obese then losing the weight without causing problems could be a long haul. Yes, you have seen stories of dramatic weight loss, but beware. If you are very obese your body has adjusted to this abnormal situation. A gradual weight loss is much less likely to cause other health problems. Exercise regimes should be started slowly if severely overweight. There are many weight reducing diets around but the basics are usually low fat, high fibre. A diet of lean meat, or fish with green salads (avoid the dressings! Use lemon juice) tends to help weight loss. Find out your body mass index to see if you are overweight and visit our pages on eating well and exercising well to help you make the lifestyle changes which can help control your weight. Read why you should eliminate sugar from your diet Now for some sobering obesity and morbit obesity facts. Obesity is now the biggest killer in the western world and the problem is getting worse. Look around you. About 1 in 4 people are now carrying so much excess weight they are at increased risk of health problems. More and more people will die of obesity related illnesses or conditions and morbid obesity. If you have got to the end of this article and realized you or a loved one has a problem, then it is a start. Unlike smoking, governments are going to have big problems with dealing with obesity. This is a problem of personal responsibility. We all need to take action. Learn about the connection between cortisol levels, stress and fat around the middle; Find out if you have too much belly fat and why fat around the middle is bad for you. Learn ho to avoid becoming obese, lose weight and stay fit and healthy. Learn Why Belly Fat is the worst type of fat and how to prevent or get rid of it. Eat to get rid of excess weight and middle-age spread, age well and look younger for longer. Share your experiences and encourage others who are embarking on a similar journey, learn from the experience of others who have managed to lose weight and keep it off, ask your questions here. Getting rid of belly fat is extremely difficult and it can be a frustrating experience. Help others by sharing any positive experiences with shedding bellyfat. Or ask a question, benefit from others who have been there before you.